August | 2007 | The S.E.E.P. First Fossil Fuel Free Roadtrip a Success! The Vegfalia Makes its Debut. After 6 months in the Autostadt West shop rebuilding the transmission and installing a 1.9L Turbo Diesel engine, our 1987 Vanagon Syncro Westfalia has finally returned to the S.E.E.P. It had biodiesel running through it’s veins within hours, and the next day I started installing the Greasecar SVO conversion kit. Because of our limited time off work, I only had one day to complete the conversion and test it before we took off for our first experimental road trip. 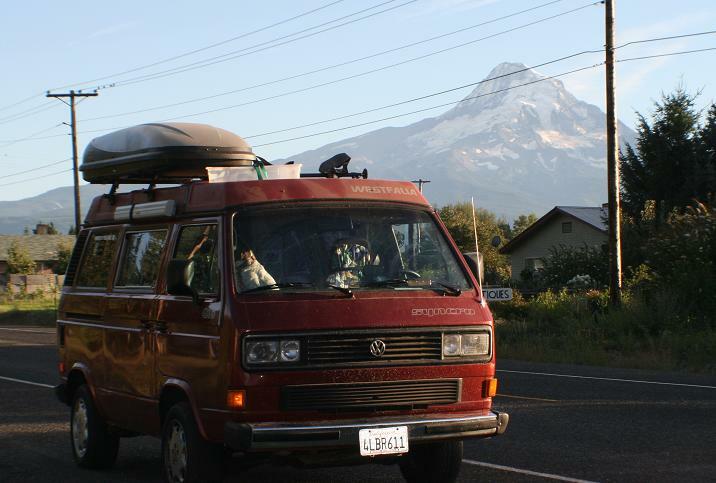 Aside from a few minor glitches, we traveled almost 2000 miles on only biodiesel and vegetable oil from San Luis Obispo, CA to Hood River, OR via Bend and then returning through Portland and Santa Cruz. Since there was a paucity of biodiesel and/or filtered waste veggie oil, we had to carry fuel with us and fill up when we could, including a Costco in Sacramento for around 19 gallons of bulk vegetable oil and a big fill-up of biodiesel in Portland including both of our tanks and 4 plastic cubes that got us home. Overall, the trip was fantastic, Laura and I enjoyed the much-needed disconnect from work and home projects, and although our dog Marley was a “nervous nellie” while driving in the Vegfalia, she definitely enjoyed the hikes. The official Vegfalia page has been started and will be regularly updated with our experiences and modifications – fossil fuel independence is not difficult and is doable for anyone who wants to put forth the effort! Letter to The Secretary of Transportation – She thinks that bikes are not transportation! This letter is in response to Mary Peters’s, the Secretary of Transportation who described in her interview how DOT funds go to earmarked projects that aren’t actually transportation like bike paths! These are the kinds of comments that show how short-sighted our administration and how much more work we all have to do. I would like this forwarded to Mary Peters. I am writing regarding Ms. Peters comments during her public television interview aired on August 15th. In this interview, the U.S. Secretary of Transportation stated that she does not actually consider the most fuel efficient mode of transportation currently available to not fit under the realm of the DOT and should not be funded. To quote, “Well, there’s about probably some 10 percent to 20 percent of the current spending that is going to projects that really are not transportation, directly transportation-related. Some of that money is being spent on things, as I said earlier, like bike paths or trails.” Although bicycling for some is sport, exercise, and recreation, for many others, it is a major method of commuting and an important part of our transportation infrastructure now and moreso in the future. My wife and I both ride 3/4 mile to work and we frequently ride 3-5 miles on errands and around town and it is an important part of how we travel locally. Fuel prices are rising and will continue to rise. Many experts admit that “Peak Oil”, that is, the point where oil production can no longer be increased and will soon begin to fall, will happen within the next 10 years. With the enormous increase in demand for fossil fuels from developing countries like India and China and continuing increasing demand in other countries, including our own, we need to expect a collapse of the oil economy within the next 20-30 years, easily within our lifetimes. Spending billions of dollars supporting this corroded and corrupt infrastructure does nothing to prepare us for the crisis that we will face. Roads and bridges need to be repaired, it is true. However, we must also have a vision of how transportation will happen in 20 years. Will electric or hydrogen cars fill the streets? Will public transportation be the norm as people are forced to move from the suburbs back into cities because travel and commuting becomes so expensive? Will human-powered vehicles be the standard for short-distance commuting? Of all these possibilites and more, biking is the only mode of transportation that requires nothing but the calories of the user, uses currently available technology, and actually improves the health of the user rather than belching toxic emissions into the air we breathe. Biking should be encouraged by the agency responsible for our Nation’s transportation. It should be made safer and more accessible. As far as the fuel tax Ms. Peters was discussing, there should be a large fuel tax. Gas should be $6/gallon or more like it is in Europe and we need to start paying for the true cost of our consumption. Some of the 453 billion dollars spent on the Iraq war should come from fuel taxes, as this war has been partially fueled by our obsession with cheap oil. Infrastructure and incentives for alternative fueled vehicles like electrics, biodiesel, cellulosic (not corn) ethanol can come from these taxes along with repealing the billions of dollars in tax breaks for oil companies. And of course, repair and maintenance of our existing infrastructure can come from this money as we slowly phase out the era of the fossil-powered vehicle. Please realize that bicycles are an extraordinarily important part of a CO2 neutral world, they allow us exercise and reasonably rapid transport for short and medium distances with no emissions and no fuel consumption (aside from dinner). Bicycles need to be included in a responsible, forward-thinking plan for our nation’s Department of Transportation. Following in Patagonia’s treehugging footsteps, Body Glove is releasing their ECO wetsuit, made from snappily named eco-flex and bio-stretch. The Eco-flex exterior is “the purest form of non toxic stretch material on the planet.” I’m not sure what that means, but it is supposedly non-petroleum based and “100% environmentally friendly.” The mid later, Bio-stretch, is made from natural rubber, and the “interior of the ECO is 100% non-petroleum calcium carbonate closed cell foam rubber. Sounds promising, we surfers have another choice in environmentally friendly wetsuits, plenty of catchy marketing words, an odd photo shoot with a surfer in a jungle, and a maybe touch of greenwashing as well. The abuse of power continues as Bush once again invokes “Executive Privilege” to keep Karl Rove, white house political aide J. Scott Jennings, and various documents that have been subpoenaed in the continuing investigation of U.S. Attorney General Alberto Gonzalez’s role in the firings of U.S. Attorneys last year. Bush has already invoked his supreme executive power in this same case to prevent other aides from testifying, and is continuing to do his best to cover up his office’s political wrongdoing and thwart the scales of justice. Although I still think that “Executive Privilege” is a cop-out way to get away with illegal activities, I can see some utility if national security is truly threatened and lives are at stake. In this case of the use/abuse of this power, however, the matter at hand is nothing more than a political power play by the Bush administration. It is very simple – they illegally fired U.S. Attorneys who were not acting in the interests of their political party. Using Executive Privilege to cover up politically motivated lies and manipulation is an obvious and abominable misuse of this power (which is NOT part of a President’s constitutional powers, by the way). Congress needs to force the administration to give up these documents and force testimony, complete the investigation of the Alzheimer-struck Gonzalez, impeach him, impeach Cheney, impeach Bush, get us out of this twisted oil war, pass some sweeping energy and trade reform, and revamp our healthcare system. Got it? Now get to it Congress – do your job and stop dicking around with rhetoric and magic shows, we’re not buying it anymore.